HBO’s prospective Preacher series never panned out, and Neil Gaiman’s American Gods is probably the closest we’ll get to a Sandman show, so it now seems possible that Showtime could swoop in and make the first series based on a Vertigo title. 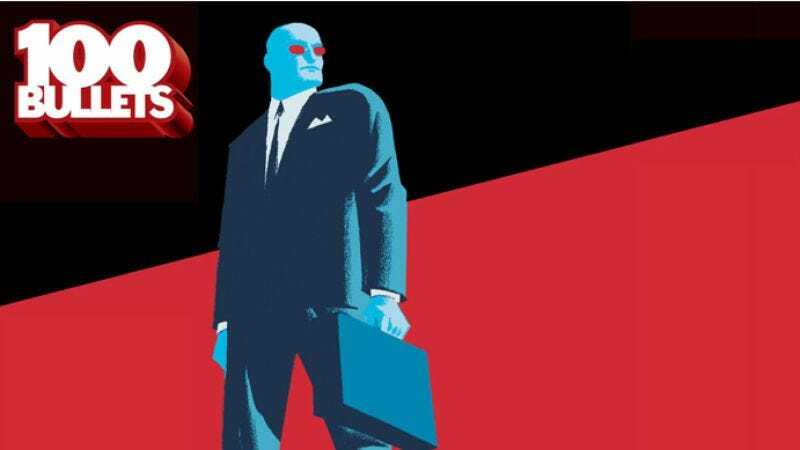 Deadline reports that screenwriter David S. Goyer is developing a project based on 100 Bullets, the pulp fiction neo-noir created by Brian Azzarello and Eduardo Risso. Goyer is no stranger to comic-book adaptations, obviously, having worked on Batman Begins and its sequels, all three Blade films, and Zack Snyder’s upcoming Man Of Steel. But of course, 100 Bullets differs from all of those, and from most comic books: There are no superheroes or supernatural twists—just regular people killing each other in cold-blooded revenge, aided by the mysterious Agent Graves and his briefcases full of untraceable ammunition. Each story is essentially another act in an ongoing morality play, as Graves provides each would-be assassin with information on how someone wronged them and why they deserve to die, then leaves them to make the ultimate decision without much further interference. True, those smaller tales eventually tie into a much larger story about a worldwide conspiracy that recalls more standard comic and sci-fi fare, but 100 Bullets also functions quite well as a series of self-contained, standalone tales that could make a TV adaptation more like an old-fashioned anthology series (like a modern-day The Hitchhiker, if you will). And granted, it could also end up spinning its wheels for a very long time while hammering home the same hokey lessons about moral ambiguity, something the comics were occasionally guilty of as well. But hey, if it does the latter, at least it will be in good company with a lot of the other shows on Showtime.